This month's book is one that I have been very curious about for a while because it's part of a series that is extremely popular and has devoted fans. And now that I've read it I'm even more curious about the book because I just didn't get it. 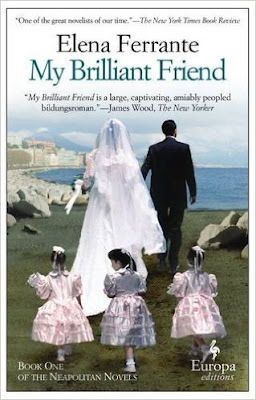 And that book is "My Brilliant Friend" by Elena Ferrante. WHY? WHY? WHY is this book so popular? I don't understand! It's the story of two poor Italian girls growing up in a small town just after World War II. Both of them are very smart, but have limited opportunities due to their financial circumstances. One is a horrible little girl (Lila) who is a terrible friend, and the other one (Elena) is her doormat and remains her friend (for decades) for some unknown reason. Yes, the book takes a look at class divisions, politics and feminism, but the main theme of "My Brilliant Friend" is friendship, specifically the friendship of Lila and Elena. And since I couldn't figure WHY Elena remained Lila's friend, the book didn't work for me. Plus, the book is SLOW. Really slow. I had heard that it picked up after 150 pages or so, and it did (a bit), but 150 pages is WAY too long to wait to find a book interesting. If it wasn't for my rule of always finishing a book once I start it, I would have dropped it without hesitation. Apparently though, I'm a glutton for punishment because I went ahead and started reading the second book in the series because I was told that book two was MUCH better than the first one. But no. I'm half way through and Lina is still a terrible person and Elena is still her doormat. I don't care how good books three and four are supposed to be. I'm done with this series. 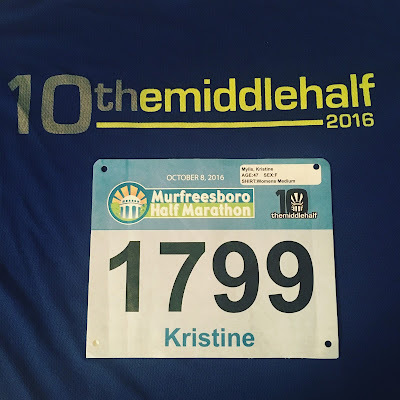 The Middle Half is a race I have been wanting to do for a long time. I'd heard some really great things about it over the years, but I've either been out of town on race day, or if I were in town, it was sold out. 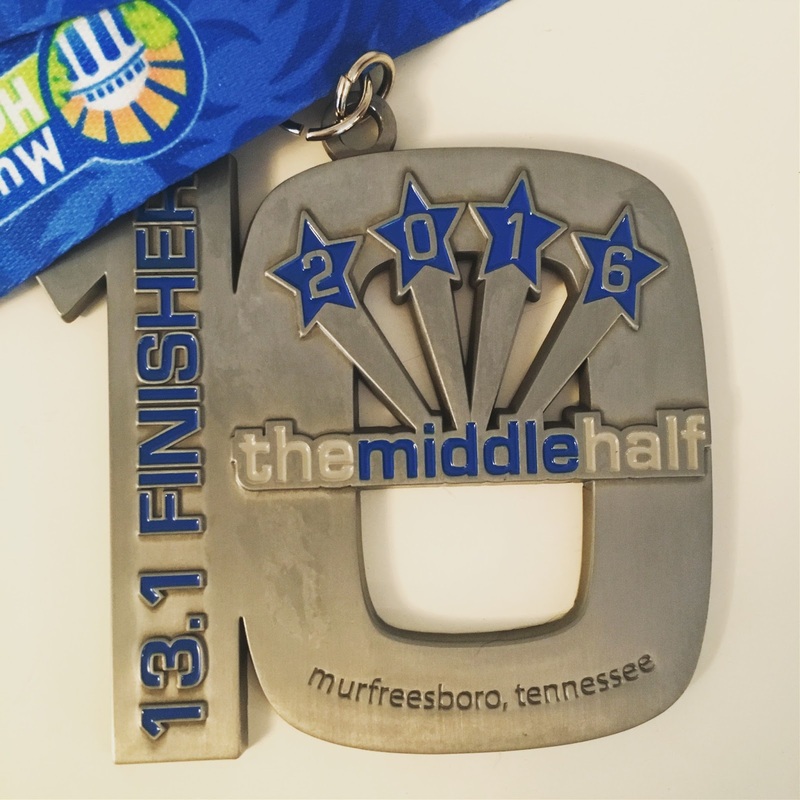 For a small race in the middle of Murfreesboro, it's surprisingly popular and has sold out on the first day in previous years. So, when I received the reminder about registration for the Middle Half a few months ago, I planned ahead and had my browser open right when registration started. I was finally going to run the Middle Half! The 10-year anniversary race at that! Race day started at 4:00 AM. Yes, that is insanely early to get up to run, but Middle Tennessee State University (where the race was held) is about 45 minutes away and the race started at 7:00 AM. We had heard that parking was a cluster due to construction, so we wanted to get there early. Fortunately, while there was construction, traffic wasn't too bad and we easily parked in a relatively close lot. It was a little chilly that morning, so we (Dudley and our friend Jennifer) decided to utilize the race bag drop and wear warmer clothes on the walk to the starting line. We ended up turning right back around though because even though the tag said "bag drop," it was actually more of a "key drop" and backpacks weren't accepted. Whomp Whomp. We were able to hook up with several of our friends pre-race. As I mentioned, this is a very popular race and lots of East Nasties (and other friends) were there. It's popular for several reasons, but the main one being that it is FLAT FLAT FLAT. People come from all around to try to PR here. And while I'm not currently in PR condition, I was curious to see how I could do. My running confidence hasn't been all that great recently. I think this is mainly due to how freakin' hot it's been and I wilt like a delicate flower in the heat. Hopefully, my runs will be a bit stronger with the cooler temperatures. The race started right at 7AM. Well, actually, I take that back. They tried to start right at 7AM. They did the countdown and everything. But the timer wasn't working or something so they didn't actually start the race after the big countdown. They fixed it within a minute or two and we were off. I started running with Jennifer and another EN Patrick. We were planning on lining up with the 2-hour pacer and see how we did. My schedule called for me to run this in 2:05, so I knew 2-hours would be a bit of a stretch, but not too much. Unfortunately, there were a ton of people who wanted to run 2:00 and we lost the pacer almost immediately. Oh well. The first 7 miles of this course were great. We ran past some beautiful historic homes and the Oaklands Mansion. There was also some wonderful course support from spectators. I was feeling really good, too. Sure, I was kind of tired of running after an hour or so, but I felt fine. Then we turned Mercury Blvd. and it all changed. This was a bigger, more highway-ish, road and not as scenic as the previous miles. We also lost most of the spectator support (the water stops / bathrooms were still on point, though). Without the distractions of pretty houses and bands, the race wasn't so fun for me anymore. The pain kind of started to creep in. We were on this road for about a mile, and then we turned Rutherford Blvd. and it was like stepping into a wind tunnel. Sure, flat races are great - unless it's windy. From miles 8-12, we were in a crazy headwind. It was brutal. At mile 10, I knew I was supposed to pick up my pace, but I just physically couldn't because of the wind. I was killing myself but not going any faster, which is really quite frustrating, so I backed off a bit and just tried to get through it without stopping to walk. And believe me, I wanted to stop to walk. At mile 12, we turned off Rutherford and headed back to MTSU. It was such a relief to be out of that headwind. By this time, I knew I wasn't going to break two hours, but I was still under pace to beat my 2:05 assigned time. I held on and crossed the finish at 2:03. I'm satisfied with that. The post-race festivities were great. They had all sorts of food for the runners, with plenty of tables and chairs for us to use. That's something that is generally lacking at races, and was appreciated here. We also received a great finisher's medal, celebrating the 10 years of racing. Next up: the NEW YORK MARATHON!!! I've delayed in posting about this last event from our vacation because it's pretty upsetting and I wasn't sure how to approach it. I supposed the best way is to deal with it directly, so here it is: Dudley found a dead body in our hotel hallway when we were in Seattle. Literally - a dead body. He had gotten up early (6AM) to get some coffee and left me in the room. Almost immediately after he left the room, he called me saying that he's pretty sure that there was a dead body in the hallway. The elevator arrived, and Dudley got on thinking that the situation was under control because the maid mentioned the police. But not only did Dudley get on the elevator - SO DID THE HOTEL MAID! Remember, she was the only other person in the area - there weren't any police or other hotel employees there at this time. She left a dead body alone in a public hotel hallway! That was when Dudley called me, told me what was going on and then he went to get coffee. At first I was going to stay in the room. I had no desire to be a part of whatever was going to go on down the hallway. But then I thought what if it was murder and the perpetrator was still on the floor? Would it be an active crime scene? Am I going to be banished to my room for the rest of the day with a killer skulking about? With that thought, I got dressed and got the heck out of the hotel. Unfortunately, I had to pass the unfortunate soul who was still laying in the hallway. By this time, there was one police officer who was standing behind the body. There still wasn't any attempt to cover him though. It was pretty surreal and very sad. When I got to the lobby, there was another police officer talking to the front desk clerk. They were talking pretty openly about the situation and, at the time, no one knew who he was. I guess he didn't have ID on him. The desk clerk stated the the person didn't appear to be a guest in the hotel, or at least not one they knew about. There also weren't any reports of concerned guests looking for someone who never returned to their room. Basically, a stranger showed up and somehow died on our floor and no one knew why, how or who he was. Comforting, huh? I found Dudley and we hung out at the coffee shop for a bit before heading back to the room. We needed to change clothes to get ready for whatever we had going on that day. We figured that by this time, the police would have removed the body or closed off the area. Turns out - nope. He was still there. Uncovered. Though there was another police officer there by now. When we left the hotel again, the medical examiner had arrived and he was examining the body. The body was still uncovered, but the ME had at least tried to shut the door a bit to conceal what was going on. The next time we came by, everyone was gone. Later that night, Dudley spoke to the night desk clerk and was told that the gentleman was, in fact, a guest and that he had a heart attack. Honestly, based on what I heard earlier from the front desk clerk, I don't know if I believe that. Especially since, while we were staying in a nice area, both Dudley and I thought we saw a drug deal go down in the park outside of our hotel. I think that a heart attack might just be a story they told us because it was the most tame explanation they could give. Even a month later, I'm still not sure how to process this event. It's tragic, obviously. Extremely sad. But when you separate from the emotion of the death, I'm also upset at how the hotel handled the situation. You think they would have done something to steer guests away from the area, but they didn't. In fact, they left the area completely unattended. I know they were probably trying to keep guests from finding out about someone dying in their hallway, but we didn't get ANY communication from them at all, even after they knew that Dudley saw him. I'm not sure what I expected the hotel to do, but definitely SOMETHING. I'm not sure how to wrap this up other than to say that I hope that the family of the gentleman who passed has found some sort of peace. I wish there was something we could have done to help him.